What are Wisconsin Academic Standards? Wisconsin Academic Standards specify what students should know and be able to do in the classroom. They serve as goals for teaching and learning. Setting high standards enables students, parents, educators, and citizens to know what students should have learned at a given point in time. In Wisconsin, all state standards serve as a model. Locally elected school boards adopt academic standards in each subject area to best serve their local community. Why are Academic Standards Important? We must ensure that all children have equal access to high quality education programs. Clear statements about what students must know and be able to do are essential in making sure our schools offer opportunities to get the knowledge and skills necessary for success beyond the classroom. What Informs the Implementation of Academic Standards? Wisconsin’s Guiding Principles for Teaching and Learning inform the design and implementation of all academic standards. All educational initiatives are guided and impacted by attitudes or principles for teaching and learning. 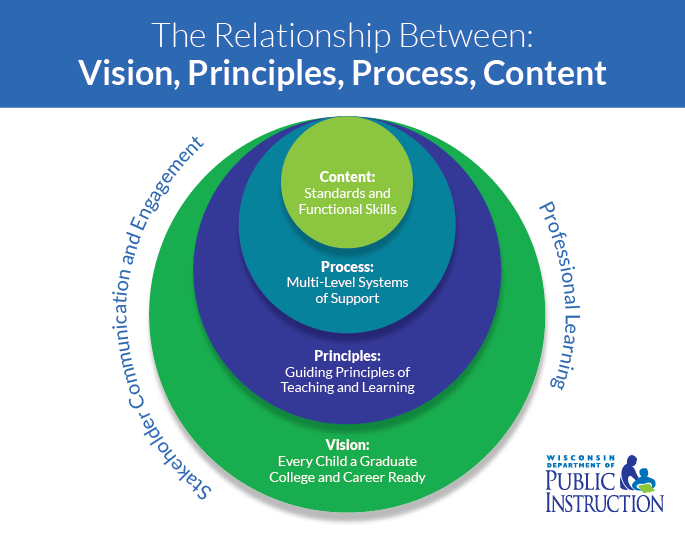 The Guiding Principles for Teaching and Learning provide the touchstone for practices that affect the vision of every child a graduate prepared for college and career. When made transparent, these principles inform what happens in the classroom, the implementation and evaluation of programs, and remind us of our own beliefs and expectations for students. See our Phase-by-Phase Rollout plan for more details. The Wisconsin Department of Public Instruction has a transparent and comprehensive process for reviewing and revising academic standards. The process begins with a notice of intent to review an academic area with a public comment period. The State Superintendent’s Standards Review Council examines those comments and recommends whether or not to revise or develop standards in that academic area. The State Superintendent authorizes whether or not to pursue a revision or development process. Following this, a state writing committee is formed to work on revision or development of those standards for all grade levels. That draft is then made available for open review to get feedback from the public, key stakeholders, educators, and the Legislature with further review by the State Superintendent’s Standards Review Council. The State Superintendent then determines adoption of the standards. The State Superintendent has started a review of standards for Art & Design, Dance, Personal Financial Literacy, and World Languages and Go to the subject pages for more information.